Managing a successful birthday party for your child. The goody bags are filled; the party table is set. The birthday child is jumping up and down with unbridled anticipation. The first pint-sized guest approaches— and the kiddie party jitters are dancing in your stomach. Will the magician arrive on time? Will the magic show be entertaining? If the act ends ahead of schedule, how will you fill the extra time? Nowadays, a smorgasbord of innovative ideas and party packages relieves parents of much of the entertainment burden of a preschool party. But “down time” during the festivities, those moments of transition or inactivity, remains a problem, especially if the party takes place at home. How do you occupy little human jumping beans while they wait for pizza and cake to be served? What is the secret to a child’s successful birthday party? The basic rule in preschool party planning is keep things simple. A magician, for example, is entertaining, but adding a clown to the line-up can create preschool sensory overload. Taxing a preschooler’s limited attention span will lead to potential disaster. Think like a preschooler, not an adult. In other words, think small, not large. Simple, not grand. The finer details of entertaining— handmade place cards or expensive tableware, for instance, are lost on preschoolers. If the party supply store is out of Bob the Builder plates to match the Bob the Builder napkins, don’t panic. The kids won’t care, so save a few dollars and purchase plain paper plates instead. Simplicity can be applied to party games as well, which need not be as fancy and sophisticated as the inflatable maze or trampoline you’ve rented for the occasion. Youngsters still enjoy time-tested, inexpensive games. Don’t overlook old favorites like “Pin the Tail on the Donkey,” or “Hot Potato.” And if the party runs ahead of schedule, be prepared. 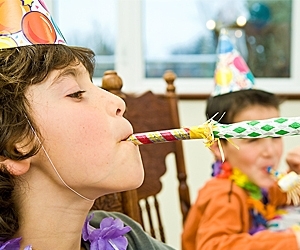 Maintain control and create smiles at your child’s party with inexpensive activities. You’ll get your money’s worth from the supplies. The kids will have fun, and unused materials can be saved for future playdates. In lieu of traditional goody bags, present the children with empty, plain, white paper lunch bags (available at craft stores or supermarkets). Allow the children to decorate their own goody bags with markers, rubber stamps, stickers, glitter or anything you can think of. Decorating goody bags is a great way to keep children calm and busy while they wait for other guests to arrive. Take photos! If you have an instamatic camera, children will enjoy watching their image taking shape in the photo. Paste photos on pre-cut poster board and let the children decorate the border. Add a magnetic strip to make a refrigerator magnet— instant party favor! If the children don’t have time to decorate their photos, they can be inserted in your child’s thank you cards after the party. Don’t dismiss interactive books and music. Believe it or not, in this age of Britney Spears and Ashlee Simpson, kids still love the “chicken dance.” An audio book’s convenience and entertainment value can’t be beat. Choose your book based on the party’s theme, and listen to the tape ahead of time to make sure it’s lively and fun. Preschoolers love movement. Musical chairs is never out of style, but be forewarned: not every child is a gracious loser. To avoid tears, play musical freeze instead. As music plays, children march or dance. When the music stops, they freeze in place. For added color and fun, let preschoolers wave crepe paper streamers as they move. Fall back on old favorites. The jump rope, hoola hoops, pin the tale on the donkey, drawing with chalk on the sidewalk, facepainting and hot potato are guaranteed to bring on giggles. There you have it: the secret to a child’s successful birthday party. Sounds simple because it is! Simplicity plus preparation equals a good time for all! Use your imagination to feed the child’s imagination, and you can’t go wrong. So... let’s party! Anne M. Mikolay, a former pre-kindergarten teacher, is a freelance writer and frequent contributor to family and Christian publications. She resides in New Jersey with her husband and two sons.